Princeton, NJ – Miele, the largest family-owned luxury appliance manufacturer, in celebration of the company’s 120-year anniversary has announced the launch of a special promotion on their G 4977 SCVi and G 4977 Vi SF dishwashers. As one of the first products launched in the US Market, Miele felt the spotlight on dishwashers would be appropriate to highlight the milestone for a company known for its German engineering and quality craftsmanship. Miele offers products to its customers that set the standards for durability, performance, ease of use, energy efficiency, design and service. This corresponds to the guiding principle "Immer besser" (meaning Forever Better) which the founders Carl Miele and Reinhard Zinkann printed on their first machines in 1899 - and which still characterizes Miele to this day. Specifically, Miele dishwashers consistently rank as one of the quietest on the market while still delivering perfect results. The G 4977 SCVi features the original cutlery tray, first invented by Miele and improved over 30 years to provide a solution to allow all cutlery to be positioned separately for optimal cleaning and drying. 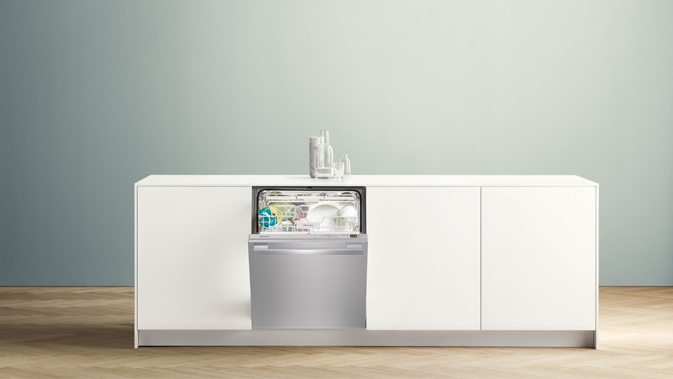 Both Models include the Miele exclusive MultiComfort area in the lower basket allows for versatile loading of all types of dishware including large pots, pans and casserole dishes. The fingerprint resistance CleanTouch Steel panel allows for a polished and premium look. The promotion will run April 1 through June 30, 2019. Please click here for more details on the promotion and to find a participating dealer. Founded in Germany in 1899 with a single promise of Immer Besser, a phrase meaning Forever Better, Miele is the world's leading manufacturer of premium domestic appliances with more than 20,100 employees, 12 production facilities and representation in nearly 100 countries. As a premium appliance brand represented on all continents, Miele is steadfastly committed to the highest quality, performance and environmental standards. Miele’s range of exceptional consumer appliances includes: vacuum cleaners; laundry systems; rotary irons; dishwashers; ranges; built-in convection, speed, steam and combi-steam ovens; cooktops; ventilation hoods; refrigeration; wine storage and espresso/coffee systems. To learn more, visit www.mieleusa.com or www.youtube.com/mieleus, and follow us on www.facebook.com/mieleus and Instagram @MieleUSA. Call us or send us an email if you have questions or requests. We will be happy to help you.